Shuffleboard tables range in size from 9 to 22 feet in length, 16 to 20 inches in width and the thickness of the board ranges from 1.5 inches to 3 inches. You can have fun on any size shuffleboard. When purchasing a shuffleboard table, you want to consider the size of your room. You want to leave at least 2 feet on each end of the table in order to stand comfortably and play the game. Shuffleboard tables are measured by the outside over- all length of the cabinet, not the board, so a 14 foot table is exactly 14 feet long. How much space is needed to stand behind a shuffleboard? Shuffleboard is fun for any age or skill group, regardless of your strength or size. If you can stand or even sit at the end of a table, you can glide the pucks down the table. In our 35 years in business many of our customers indicate that shuffleboard is a game enjoyed most by all family members. 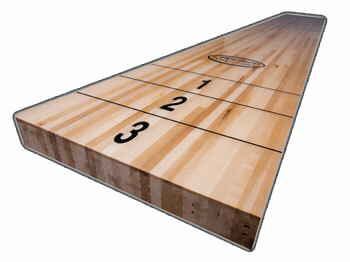 Shuffleboard helps to develop eye hand coordination and requires finesse and a soft touch. Try Shuffleboard. You will find it enjoyable! Shuffleboard tournaments can be found around the country and range in size from local to regional tournaments. You can always find a place to join a league or find a tournament to play Shuffleboard. For information on tournaments and league play please check out our list of shuffleboard tournament resources. Shuffleboard tables come in many different woods and styles to fit any decor. The price is reflective mostly of the materials used. Hard Maple wood costs more than Birch or soft maple, while a solid wood cabinet is more expensive than one made with veneers and laminates. The most important part is the board or plank so you want to make sure it is a professional plank or well manufactured board. If the shuffleboard surface can not be adjusted or will not stay true, you will not be happy in the long term. Shuffleboard Tables come in contemporary to traditional designs at all price ranges. We can even make a custom table for your very own Shuffleboard.